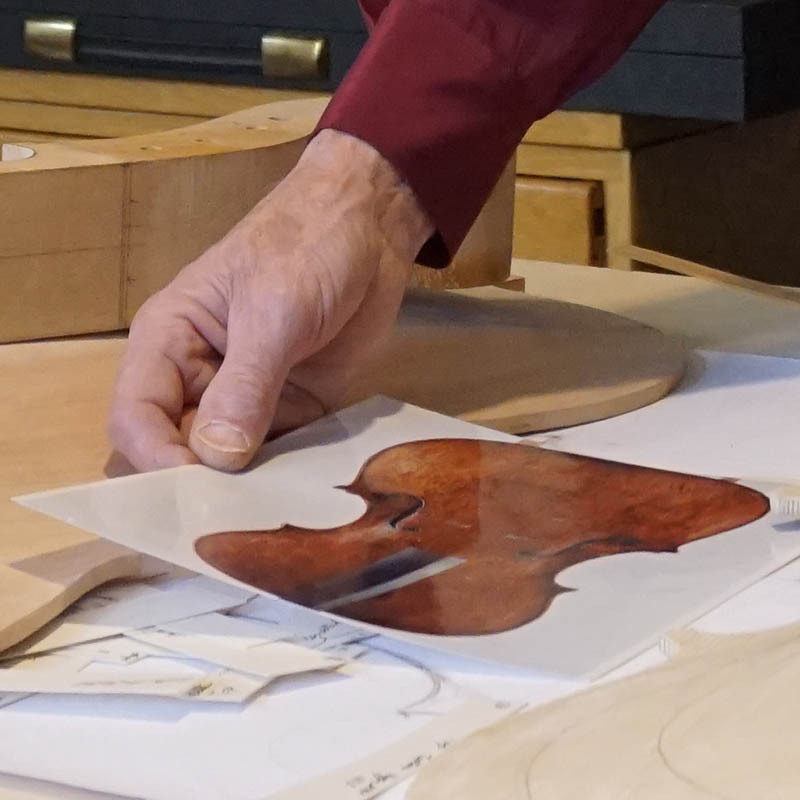 Boston-based Curtis Bryant has combined scientific study of cello design with knowledge gleaned from forty years restoring 18th century cellos to recreate the elusive sound of these classic instruments. Beginning with Dario D’Attili, a 35 year associate of Simone Sacconi, as a mentor Curtis has made cellos for forty years. Bryant cellos are famous for their ease of playing, outstanding concert hall projection, and captivating sound. These cello are made from wood personally selected at European sources in the late 1970’s. Hand split willow and beech are used for Testore copies. Study of classic oil painting informs the making of Cremonese style varnish and pigments. Curtis Bryant cellos have been used by players in the Boston Symphony Orchestra, New York Philharmonic, Hartford Symphony, and Walden Chamber Players. Curtis has a particular interest in smaller body cello models including Guadagnini, Landolfi, and late Stradivari. Full-size models include Testore, Stradivari, and Ruggieri. I have had the pleasure of working with Curt Bryant for almost forty years now. Robert Koff, the unforgettable violinist of the original Juilliard Quartet, first introduced him to me. Since that time, I’ve had the pleasure of playing several lovely instruments made by Curt, including one made for me. His most recent cello is exceptional in its rich, complex and powerful tone. It has a sound that easily rivals the old, Italian instruments and sets Curt apart as one of the best living makers today. I am delighted to give my highest endorsement to the renowned luthier, Curtis Bryant. The beautiful Strad-model cello that he made for me, which I first played in the Boston Symphony, was integral in my ability to win an audition for associate principal of the New York Philharmonic. After the audition concluded, committee members told me that in screened rounds as well as in the finals my beautiful five-years old Bryant cello was identified as one of the two or three great (presumed old!) cellos they had heard in the auditions. Subsequently while sitting in the principal chair at the Philharmonic for the next ten years, I played many solos on the Strad model cello, as well as an equally beautiful Guadagnini- model cello which Curt made for me. Curt’s cellos always possess a depth of tone, great personality, and wonderful projection whether I play as an orchestral soloist, recitalist, or chamber musician. They say that no instrument plays itself, but I know that Curt’s cellos have made it possible for many players (including me) to fully realize their instrumental abilities and to find their musical “Voice”.